Wanna hear something mind blowing, my fellow Americans? 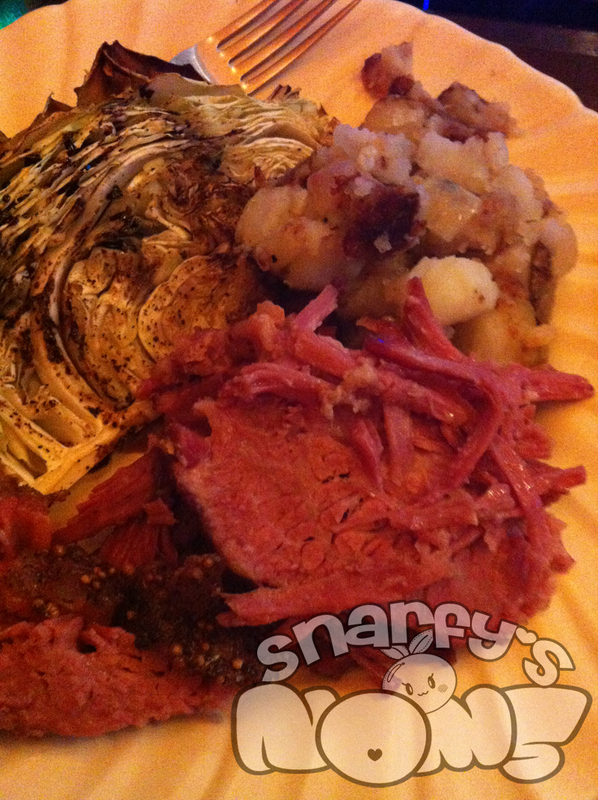 I’ve heard that corned beef and cabbage isn’t really a traditional Irish meal for St. Patrick’s Day. Whaaaaaaaaaaat? Normally I would get all geeky and research this, but I’m going to go the lazy route and simply say that corned beef and cabbage is a tradition in my house. Sure, we’re not Irish and this might be another case of bastardizing a holiday, but whatever. March 17th rolls around and I want corned beef and cabbage. There. I’ve always been one to boil or slow cook a corned beef, serving it with boiled potatoes and boiled cabbage. Ummmm. Boring. So this year, I looked around for other methods of cooking a corned beef this year, and I think I’ve found the way that I will be using the rest of my life: ROASTING. Honestly, who’s surprised? I roast a lot of things. But lemme tell you… ROASTING. Hnnngggghhhhhh…. yes. So much more flavorful than boiling everything. Let’s just say that there wasn’t much beef or cabbage leftover this year. I used a pre-brined brisket, of course. That’s easy and requires very little planning. Brining your own takes about 10 days. It’s something that I definitely want to do next year, but I totally didn’t plan for it this year. If I could re-do this roast, I would have done something about how salty it ended up being. I rinsed the meat after taking it out of the package, but boiling helps temper that saltiness. I know, I know… what’s the point of salt-cured meat if it’s not salty, but it was sooooooo salty. I don’t really add a lot of salt to my cooking so it got to me this time. If I do go pre-brined again, I think I might try partially boiling it and then finishing it in the oven. Preheat your oven to 325 deg F.
Remove the brisket from it’s packaging and rinse it off. I know the package directions will say not to, but it’s so infused with salt that you got to. Place it fat side up in your baking dish and sprinkle the seasoning packet over the top. Now sprinkle on a lot of ground black pepper. Rub all that goodness in there. Cover the baking dish with aluminum foil and put that bad boy in the oven for about 2.5 hours. Uncover the dish and put it back in the over for another half hour or so. The brisket is done when a fork can easily be inserted in the meat without much resistance. If the meat pushes back, bake for another 30-60 minutes. Meanwhile, make a balsamic reduction by putting a fair amount (aka the whole bottle) of balsamic vinegar into a pot and heating it over a medium flame on the stove. You’ll want it to get bubbly, but not a rolling boil so back the heat off if it gets too rolling. Keep an eye on the vinegar until it’s reduced by a fair amount and it’s a concentration that you like. Then take your cabbage and cut it into wedges. Get it on a rimmed baking sheet and drizzle it with some oil. Shower those wedges with some salt and pepper. One the meat is done and resting, crank the heat on the oven up to 375 or 400 deg F. Pop your baking sheet of cabbage in there to cook them. Tip: if you really want and have the time (you should, I mean you’re roasting a corned beef afterall), before you get those cabbage wedges in the oven, sear them in a pan on the stove first. While the cabbage is roasting and after your meat is rested, slice that brisket against the grain and arrange it on a platter. Get those cabbage wedges on there too and drizzle them in that balsamic reduction that you made. Now forget about dishing this up on individual plates and just go ham on this awesome roasted corned beef and cabbage that you just made. Go ahead. I won’t judge. In fact, I’ll roast some of my own and join you. Don’t worry about sharing.